ministries: reach as many people as possible with the gospel of Jesus Christ, involve as many people as possible in that mission, and strive to do everything with excellence because we serve the King of Kings and Lord of Lords. With those goals in mind, in 1986 the north Columbus congregation set out to tell the story of Jesus through a clear, memorable, live experience featuring music, drama, media, as well as any other creative element that could be employed. 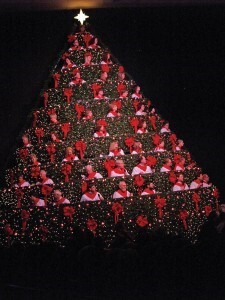 They built two towering, 30-foot tall, steel “Christmas trees” to hold the choir, constructed huge sets to transform the auditorium into biblical-times Bethlehem, and appealed to the congregation’s giftedness to help make Living Christmas Trees a reality.